You may not want to make the veggie lunch meat I posted yesterday for your daily brownbag at the office, but you will definitely want to make it for this recipe. I guarantee that you will be overwhelmed by its sweet and messy awesomeness. 1. Make the BBQ sauce and let it simmer while you cut the seitan (use a very sharp knife). Don't worry about cutting whole slices, just shave off thin bits and pieces. The meat is tough enough to hold up in the sauce, and the thin slices make for a perfect texture. 2. Add seitan to sauce. 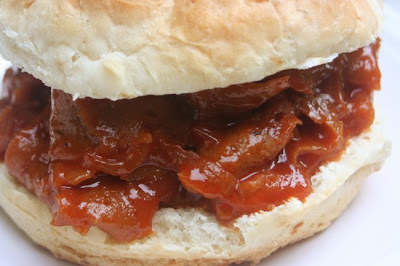 Add enough so there isn't a lot of excess sauce, but enough to thickly coat the seitan (like you see in the pic above). Let simmer for as long as possible, covered. Pile onto toasted buns and enjoy!